But why would there be a Ferry Street this far inland? A lot of “old street names” on the 1909 Bromley Atlas Plate such as “Canal Street”, “Water Street” and “Oceanview Avenue”, just as “Ferry Street”, were obviously not named for their proximity to a body of water. 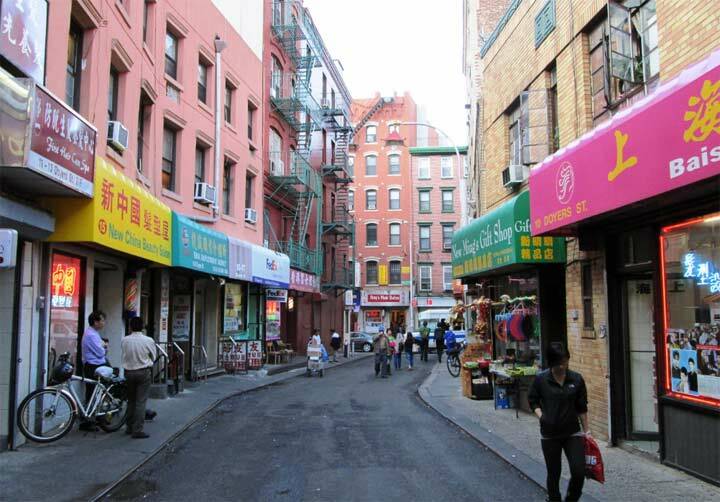 To me it appears that a lot of the “old street names” of Woodhaven, were possibly named for streets in Manhattan or Brooklyn, such as Canal Street (Manhattan), Park Place (Brooklyn), Clinton Street (Brooklyn and Manhattan), Suydam Street (Brooklyn), Morris Street (Manhattan), Columbia Avenue (Street, Manhattan and Brooklyn), Snedeker (Snediker) Avenue (Brooklyn), Pitkin Avenue (Brooklyn), Vandeveer Place (Brooklyn), (Ferris(s) Street (Brooklyn), Diamond Street (Brooklyn), Grafton Street (Brooklyn), Johnson Avenue (Brooklyn), Ashland Avenue (Place in Brooklyn), etc. Some of the names on the eastern side of the map plate (which were renamed in Queens), actually cross the borough line and exist in Brooklyn today under the names that appear on the 1909 Bromley map plate, such as Drew Avenue (Street), Ruby Street, Forbell Avenue, and Pitkin Avenue and Fulton Street. Eldert’s Lane stills retains it’s original name and remains the borderline street (in this area). There is no Ferry Street in Brooklyn or Manhattan, but there were many East River “ferry crossings” it could have been referring to. Just a thought, but might it not have been named for a person whose name was “Ferry”? I have great interest in old Woodhaven maps … FYI in the 1909 Bromley Atlas mentioned … the buildings shown with a redish coloring were brick … those in yellow were wood frame . Note in that map , north is positioned to the viewers left . Names of many streets changed in the blink of an eye … from the current Jamaica Ave . , almost to Atlantic , and 78 St . to 85 St . were the grounds of the Union Course Race Track from around 1850-1885 . My Dad was born in 1917 on the block now called 87 Rd. , in 1917 it was Downing St . , before that 3rd St . . The last two street names were from the days that address was listed in Union Course , NY … after about 1922 , that and surrounding blocks became Woodhaven . Fun fact … that same 87 Rd , was where singer Brian Hyland grew up … one of his brothers was in my St . Thomas School class . Interesting historic local stuff if you Google Neirs Bar or Neirs Tavern . Former local Baseball Field / Auto Racetrack , Dexter Park , is also mentioned and pictured in many sites …. Babe Ruth even played there . Wait! You mean Pop’s is still there!. I thought it closed not long after Jahn’s. 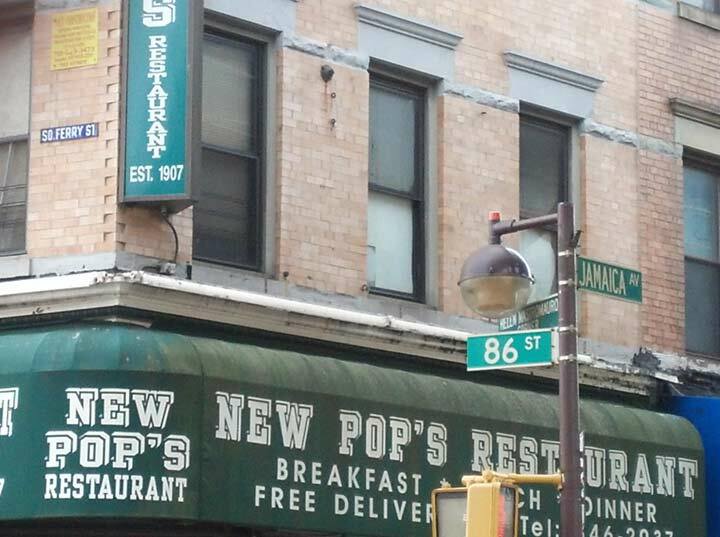 Yes Jim , Pop’s is still there , several owners since the original founder Andrew Popp ( 1894-1972 ) , an immigrant from Germany . The menus have changed over the years , now somewhat like a diner with ice cream , the inside is 90% intact ( tin ceiling , booths , counter with stools , huge mirror , , lots of historic photos still on the walls , etc . ) from the days when it was a major hangout for us Woodhaven kids in the 1950-60’s . I have a copy of the 1873 Beers Atlas page of Woodhaven … even then 86 St . was called Ferry . Recently I have been in touch with one of Andrew’s grandchildren , now age 65 . I get back to Woodhaven once or twice a year , much has changed but if you remember Popp’s , a Sal’s Pizza still stands where it has been for 55 years , across the street , where I can recall the 15 cents a slice pizza . If interested , pay our great historic old town a visit … best during the daytime . Also Neirs Bar on 78 St . and 88 Ave . still open since the 1850’s … scenes from Goodfellas and Tower Heist filmed inside . a guy named ditmars wanted to turn east new York into a port to relieve all the boat traffic in manhatten and new jersey.his original plan was to bula canal from Jamaica bay all the way to flushing .he was a and developer from Connecticut.